Last night I argued that Ezra Klein went too far when he suggested that presidents have little power to persuade. Today, Ezra acknowledges a distinction between agenda-setting and persuasion. In the case of Iraq, for example, it’s true that public opinion about invading Iraq never actually changed much between the late 90s and 2002. But George Bush unquestionably put Iraq on the national agenda. Before 2002, it wasn’t a big deal. After 2002, it was. 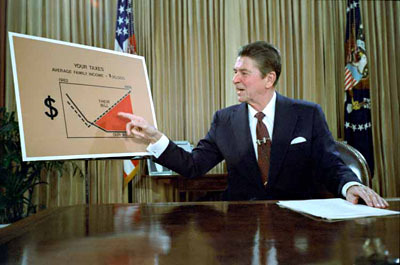 Kevin also argues that Ronald Reagan’s presidency changed the public’s attitude towards taxation in an enduring way. This is conventional wisdom, but it’s not evident in the polling. If anything, the belief that the income tax people paid was “too high” fell after Reagan. okay. More recently, Barack Obama has had considerable success arguing for tax increases on wealthier Americans. But I’m sure there’s more thorough scholarship on this subject, and I’m open to being proved wrong. There are some important points to be made about this. First: we should be careful not to take opinion polls too seriously. Gallup may say that attitudes toward taxes didn’t change a lot pre- and post-Reagan, but the real world says different. Before 1980, it was possible to raise taxes both locally and at the federal level. After 1980 it became virtually impossible, and after the early 90s it became very nearly literally impossible. In Congress and at the polling place, where it really matters, public opinion was loud and clear: higher taxes were a killer. Second: it’s not just broad public opinion that matters. Persuading the base matters. Ramping up intensity matters, even among a minority. Raising money matters. And persuading the chattering classes matters. Those are all things that presidential persuasion can affect, even if they don’t get picked up in the latest Gallup poll. Third, there’s always a pendulum effect. If your campaign to lower taxes succeeds in lowering taxes, it’s natural that even the tax fighters will start to relax some and become more open to the idea that existing tax rates are OK. That doesn’t mean persuasion on taxes has failed. Just the opposite: it means it worked! But no amount of persuasion will keep people heated up no matter how low taxes go. That’s just not a realistic bar. Now, I don’t want to pretend that the tax revolt of the past 30 years was all Ronald Reagan’s doing. It wasn’t. He came into office on a wave of anti-tax sentiment that was already ramping up, and there was a big institutional movement to back him up. But did he really have no effect at all? That’s a tough nut to swallow. He was the most important public face of the anti-tax crusade, and I think his choice to talk about taxes endlessly for eight years made a difference. Three decades later, it still does.